When the wine bug first bit me back in the early 1980’s, Zinfandel became my favorite varietal in large part due to the wines of Ridge Vineyards. Their field blend from the Geyserville vineyard in the Alexander Valley AVA of Sonoma County soon became the benchmark that other Zinfandels were judged. Although I also greatly admire the Ridge Lytton Springs bottling, I always come back to Geyserville for the power and elegance that could only come from old vine Zinfandel, Carignan and Petite Sirah grown in this vineyard. Over the years the wines have been distinct and very malleable to the vintage but the layers of dark fruit flavor is always represented. So this wine was the natural choice for me to pickup to celebrate my birthday this past weekend. 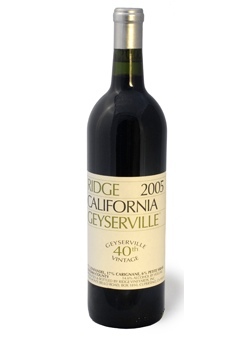 Ridge Vineyards, Zinfandel, Geyserville 2005 ($34) – A field blend of 77% Zinfandel, 17% Carignane and 6% Petite Sirah. Very deep black-purple color with aromas of blackberry, kirsch, sage, fennel and cedar. The palate is classic Geyserville, with layers of dark fruit — blackberry, black cherry, black raspberry — supported by black pepper and spices. The tannins are firm but nicely integrated making the wine well balanced and very enjoyable right now. I would also expect this to age well over the next 8 to 10 years. Paul Draper is indeed a genius. If you ever have a chance to visit the winery on Lytton Springs Road, by all means do so (we live down the road and spend quite a bit of time there). They rebuilt a few years ago with straw bale constuction (I believe it’s the largest straw bale building in North America) and it’s just a stunner, as are the views. By the way, I know this is totally off topic, but if you have a moment, please check out http://www.generouspour.com, a partnership project I’ve been involved with between Clos du Bois and Share Our Strength, working towards ending hunger in America. There are recipes, entertaining tips and music playlists, along with a full on “party kit” with downloadable invitations, menu templates, votive covers and even donation cards in case you’re moved to turn your feast into a charitable fundraiser to benefit Share Our Strength. And . . . when you download a holiday song on the site, Clos du Bois will donate $1 to Share Our Strength. Thanks! And happy birthday to you! I very much want to buy it.